A story about a little girl who chooses mischief with her friend over doing the chores that her parents put before her. . . .The careless use of a lamp[Pg 18] might destroy many lives and much property. If you play with fire, though you do not mean any harm, you may burn the house in which you live, and perhaps destroy the lives of your friends. A little carelessness may produce dreadful results. The want of thought for a few moments may do more mischief than you can repair in a whole lifetime. Kate Lamb was not a bad[Pg 19] girl at heart. She loved her parents and her friends as much as any little girl; but she often gave them a great deal of trouble and sadness by her carelessness. 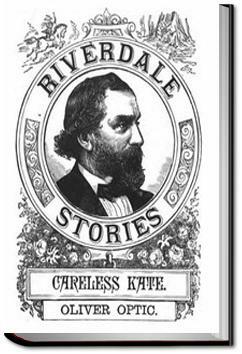 She was so thoughtless that she had come to be called "Careless Kate." It was a bad fault; and it sometimes led her to commit worse ones, as my story will show. "Now, Kate, come into the house; and next time, when[Pg 20] I call, come at once," said her mother. "If you had minded me, perhaps my flower would not have been spoiled."